Abstract expressionist painter Willem de Kooning was diagnosed with Alzheimer’s disease in his 80s. 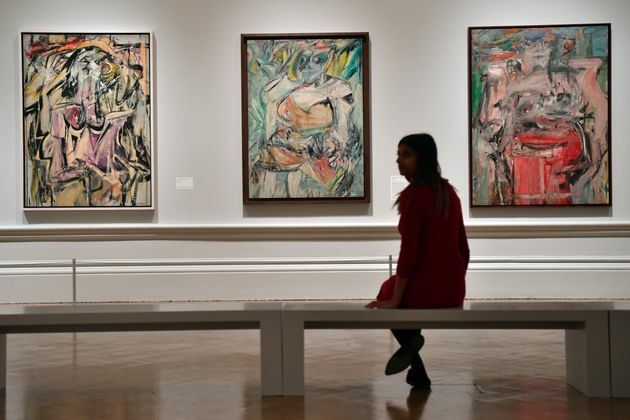 However, a new study by Alex Forsythe at the University of Liverpool claims there were signs of de Kooning’s cognitive decline apparent in his paintings, long before his condition was medically detected. Forsythe set out to determine whether changes in artists’ brushstrokes over long periods of time could help detect signs of dementia or other neurodegenerative disorders. She analyzed 2,092 paintings, with work by de Kooning, as well as Claude Monet, Pablo Picasso, Marc Chagall, Salvador Dalí, Norval Morrisseau and James Brooks. Forsythe examined the works using a technique called fractal analysis, highly contested among physicists, to determine whether there was a relationship between the fractal complexity in a painting and the brain activity of its artist. Fractals are complex, self-repeating, geometric patterns ― like the spirals that appear in Romanesco broccoli, or the patterns formed by certain mountain ranges. If you examine a painting closely enough, some researchers contend, artists’ brushstrokes break down into such geometrical shapes, so unique to each artist’s hand they operate almost like fingerprints. In 1999, physicist Richard Taylor notably used fractal analysis to differentiate authentic Jackson Pollock paintings from forgeries by identifying the artist’s singular fractal fingerprint. In her study, Forsythe traced the complexity of fractal patterns revealed in each artist’s work to gauge whether the fractal density increased or decreased over time. For Monet, Picasso and Chagall ― none of whom suffered from neurodegenerative disorders ― the fractal complexity of their works increased over time. In the works of Dalí and Morrisseau ― who were both believed to have had Parkinson’s ― Forsythe found that the fractal complexity first increased, then declined. Finally, for de Kooning and Brooks ― the subjects diagnosed with Alzheimer’s ― Forsythe discovered that fractal complexity plummeted as they grew older, beginning around age 40. The study revealed signs of shifting brain function in de Kooning’s paintings over 40 years before he was diagnosed by doctors. Nevertheless, there is something profoundly beautiful about the possibility of brushstrokes depicting the inner workings of the brain in complex yet perceptible ways. Each painting, then, not only depicts its subject matter but also the interior world of its maker, in ways he or she might not even be aware of.